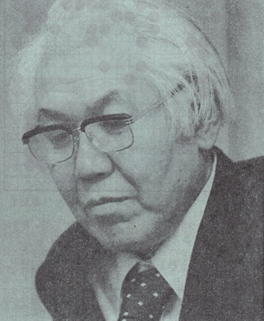 The “Wizard” in GoWizardry comes from “hengen” 変幻, which was also the nickname of Yamabe Toshiro. 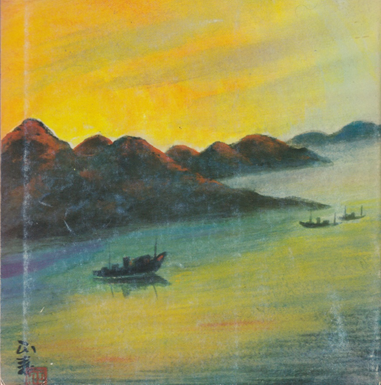 He was known for the ingenuity of his play, and for years he published a feature in Kido magazine that examined complex positions in detail. In doing so, Yamabe illustrated the depths of professional reading. Last time, the Challenger Final of the 3rd Annual Meijin Tournament was analyzed by Rin Kaiho, Kobayashi Koichi and Cho Chikun. It was a fine article, but due to limitations of space, only the high points were covered. 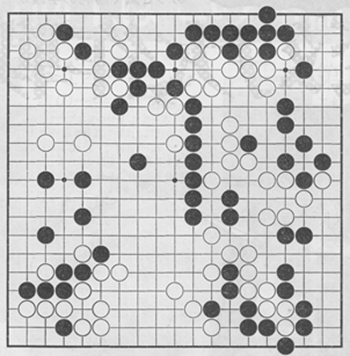 This time, using that same game, Yamabe shows the hidden variations that lie beneath the surface. He takes the critical point of the game, and makes it clear the feats that the best players perform in reading out variations. 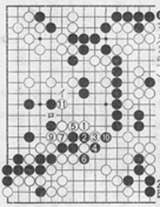 ― Otake san defeated Rin san 4-2 to become Meijin for the second time, but this is from the Challenger Final that was played when Otake san and Kato san finished with the same 7-1 score in the league, you know. Yamabe: This is the decisive point of the game where Otake san, holding White, played brilliantly to win. The subject was how, in the latter half of this difficult game, Black could wrap up the win, but at this stage the board position is not easy for Black. ― For this game, Yamabe san was the commentator [for the sponsoring Asahi Newspaper] and I was the writer. However, due to space limitations in the newspaper, there was no way to fit the great number of variations into the article, you know. This is the actual course of play in the game. Since Black haned at 1 and connected at 3 in the corner, White answered with 4 and 6 to take hold of Black’s stone. (If Black tries to run out by playing at イ, the fencing-in move of White ロ means that Black will not be successful.) With this, the outcome was clearly decided. After the game, both players indicated that Black 1 and 3 were the losing moves. Here, they declared that Black had to exchange 1 for White 2, and after that play Black 3 and 5. 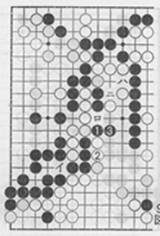 Unlike the case with White 6 in the previous diagram, Black’s stone in the center could not have been completely taken. The nuance is that Black still had a chance to win. Yamabe: When the game was over, in the thoughts that the players gave immediately, precise cases and fully examined positions were not offered, so there were parts that remained vague. Two of those were prominent. For Black 3, how would it be to further hane at イ (leaving the opportunity for White to connect underneath at ロ)? There is also that question, but in general giving all deference to the thoughts of the players here, I will take this diagram as the basis to use in expressing as best I can what could have been played after that. If play proceeds as in the previous diagram, White then exchanges 1 for Black 2, whereupon the technique [suji] of White 3 and the attachment of 5 becomes possible. Although the two stones cannot be captured directly, there are potential problems [bad aji] in the center, so my opinion is that it is difficult for Black to find answering moves. ― 5 is another stylish move, you know. Backtracking, in regards to Black 2, is this defensive move the best way to play? Yamabe: Going with White 1 at the shoulder is good technique [suji], you know. If Black ignores this to play 2 elsewhere, White cuts at イ, and retrieving the stones here is an extremely big move. Next, the peep of ロ is White’s prerogative, and the endgame play on the upper side is changed significantly. ― Then, when White attaches with 1, how does Black answer? Yamabe: What may be taken into consideration are three defensive moves, Black イ, or else ロor ハ. We will examine all of them here, but no matter what happens, the play will be in coordination with the cut of White ニ, producing large scale variations. Yamabe: First, let’s go with the answering move of Black 1. In response to this, in order to make shape, White cuts at 2, and then the fencing-in move of 4. ― And if Black moves out with 5? …Black butts against White’s stone with 7, then pulls the stone out with 9 and 11. 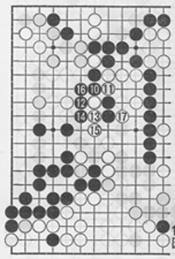 The connection of Black 13 could naturally be played as a hane one point to the left, but since the intent in this diagram is to put the shape of the stones in order, this connection conforms to that purpose. And then White extends at 14 here. ― Black has no alternative but to capture the two stones with 1, you know. Yamabe: Next, White plays atari with 2, and then makes the diagonal attachment of 4. ― What is this?! Somehow Black’s position in the center has become precarious. …Black would cut at 5, but at that point taking control of the stone with White 6 is correct. Even though Black can push through with 7 and 9, White 10 through 14 produces life for the group in the center, while Black’s ten stones wither on the vine just like that. What must be paid careful attention to is that when Black plays at 1, it is the atari of White 2. In that case, the tables are turned and it is White that ends up in a precarious state. ― Should White take the four Black stones with イ, the connection of Black ロ captures the tail end of the group. Is that it? 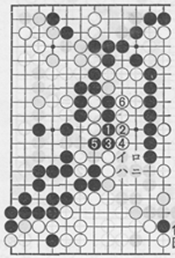 Yamabe: Instead of White イ, if White captures in the center with ロ, Black connects at イ. In order to make life for the group, White might play ハ, but Black ニ deprives White of two eyes. 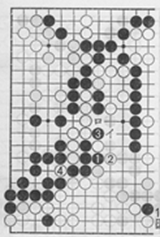 Neither side’s stones in the center have two eyes, so the position is one of a race to capture, but White does not have the advantage in that case, which is shown later on in one example played out in Diagram 26. That will be easy to see there. ― After Black extends at 3, and White captures four stones at イ, White does not have the advantage in the board position, you know. Yamabe: No doubt the outlook in the board position is questionable, but White 2 is terrible. Had this been played as the move to take control of Black’s stone in Diagram 8, Black would have been captured, so from that standpoint speaking of the question of the variation in the center at the present time is superfluous. ― Instead of the cut of Black 1 in the previous diagram, how would it be pushing through at 1 here? 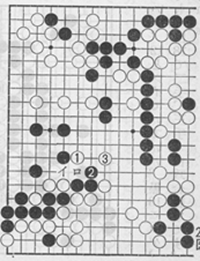 Yamabe: If Black obligingly pushes out at 1, the block of White 2 is good. Even if Black cuts at 3, White 4 ends up capturing five stones with one move. 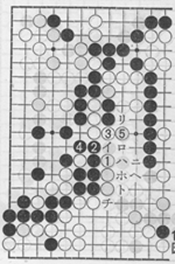 Next, should Black draw back at イ, White takes two stones with ロ, or if, instead of playing at イ, Black connects at ロ, White イ immobilizes the four Black stones. ― An interesting point, isn’t it? When Black cuts at 5 in Diagram 8, taking control of the Black stone with 6 is good, is that it? Then, if Black pushes out with 1 in Diagram 10, it’s the block of White 2, you know. In that case, from the attachment of White 1 through the fencing-in move of 5, at that point, instead of pushing out, what about simply capturing the two stones with 6? Yamabe: White plays the atari of 7, then likewise cuts at 9. 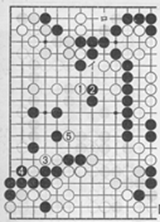 Yamabe: Starting with the butting move of Black 10, in the same way, Black plays atari with 12 and 14. 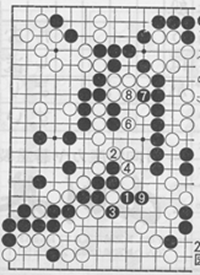 When Black connects at 16, in this case the diagonal attachment of White 17 is good. ― Next, if Black moves out at 1? 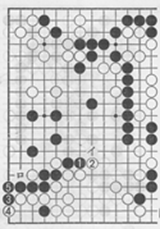 Yamabe: White presses at 2, and although Black can play 3 and 5 to capture three stones, White makes the defensive reinforcement at 6, and Black is completely destroyed in the center. ― The cut of Black イ is met by White ロ, Black ハ and White ニ, with a ladder, you know. Where did Black go wrong? To have stones captured like this is terrible, you know. Yamabe: It’s not that Black’s way of playing in Diagram 5 or Diagram 11 and the sequences that followed was bad. The fact is that after incurring the attachment of White 1 in Diagram 4, it is not easy for Black. This struck at the vital point of the shape of Black’s two stones. In connection with the cut in the area above, it is terribly difficult to survive [shinogi] in both places, you know. It was stated that there was the potential for problems [bad aji] in the center, and this was the part that was pointed at. ― That was a fantastic thing to aim at, you know. Regardless of that, would you show us a few more variations? In reply to the attachment of White 1, if Black perseveres with 2, how does it turn out? Yamabe: This is something thrown in for the reader’s entertainment, but the first impression is that Black is no good here, I must say. Naturally, the fencing-in move of White イ is also possible, but in this case let’s see what happens after simply cutting with White 5. ― In accordance with the other examples, Black butts against White’s stone, and plays the sequence through the connection of 12, no? Yamabe: Coming to this point, directly playing atari with White 13 and 15 is good. ― Rather than playing 13 as the fencing-in move of 15, this way is not loose at all, you know. 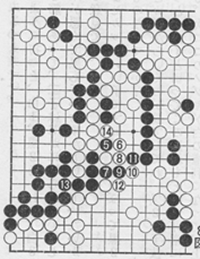 …White plays atari with 17, then the diagonal attachment at 19. ― This is similar to White 4 in Diagram 7, you know. Yamabe: Afterward, things go a little bit differently. Next, should Black move out with 1 and 3, White discards four stones with 4, then connects at 6. ― After that, Black cuts at 7, and how in the world does it go here? Yamabe: This time the liberties are filled, so the ladder in Diagram 13 does not work. However, it is okay after playing atari with White 8 and 10, then connecting at 12. Even if Black turns at 13, and play 15 and cuts with 17, White 18 makes it three moves to two moves, so White wins the race to capture. When White played atari at 1, what if Black butted against White’s stone with 2? Yamabe: Without doing anything else, White just turns at 3, which is elegant. Then, if Black plays 4, there is nothing to prevent White from extending at 5. ― Next, if Black pushes through at イ, White plays ロ, and Black cuts at ハ, then play continues with White ニ, Black ホ, White へ, Black ト, then White connects at チ, and everything is fine, you know. This is another variation where Black is swallowed up, no? 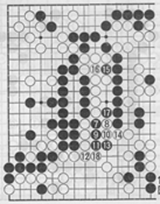 What I was thinking was that for White 3, White blocks at イ, then after Black 4, White plays 3, and I was wondering what would happen if Black moved out at リ.
Yamabe: I would be all right playing that way, but turning with White 3 is good technique [suji],and easy to understand. ― One other thing is that when White attaches at 1, please explain what happens when black turns at 2 in order to move out. Yamabe: With that, White makes the fencing-in move of 3, you know. Next, Blackイ is met by White thrusting in at ロ, and play proceeds as in Diagram 5 and the rest. Therefore, let’s look at what happens when Black pushes through at 4 and takes control of White’s stone with 6. Here, White fixes the shape by playing atari with 7 and squeezing with 9, then cuts at 11. After Black 12 through 18, White makes the diagonal attachment at 19, and the shape is the same as in Diagrams 16 and 17. ― When White makes the fencing-in move of 1, can Black push through with 2 and play atari at 4? 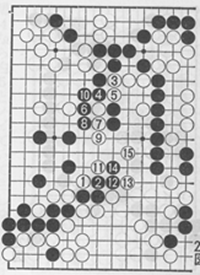 Yamabe: With that, White 3 and the following moves wrap Black up and squeeze, then White connects at 9. Black 10 is answered by White making a connection out with 11. By rescuing these stones, the center area has been laid waste to, so White has the advantage in the game. ― Next, Black hane over White’s stone with イ is met by the atari of White ロ, so that these stones cannot be captured, you know. Yamabe: Instead of White 11 in the previous diagram, the atari of 1 could also be considered. White aims at playing the technique [suji] of イ, Black ロ and the placement of White ハ, but that’s a different question. When Black draws back with 2, White plays 3 and the following, then cuts at 9. This makes equivalent options of a cut to the left of 6, and a nose attachment to the right of 2, so White has no worries about these stones. However, it’s not necessary to go this far. The attachment with White 11 in the previous diagram is sufficient. ― It really seems that once White attaches at 1 in Diagram 4, it is painful and difficult for Black, you know. The hane and connection on the first line in Diagram 1 were the losing moves, and although playing Black 1 through 5 in Diagram 2 was better, that was not necessarily correct, is that so? Yamabe: The board position in this game was difficult, so whether it was reasonable to question if it was correct or not, I do not know. Well then, I don’t by any means intend to corner the two players, and demand answers from them. All that I can do is to use the position as the starting point to expose the techniques [OR, lines of play, in both cases, suji] that occur to me. 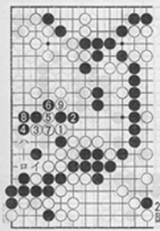 Ishida san (Yoshio 9 dan) is a master of positional judgment, and as he said, it is certain that when it came to this point, it was not easy for Black, you know. ― Due to space limitations in the newspaper, it was impossible to explain all the details of these large scale variations, so I think that readers are interested in seeing them, I must say. Yamabe: However, I had a difference of opinion about one thing. After exchanging the atari of White 1 for Black 2, White cuts at 3. I thought that this simplifies things. In other words, following Black 4 through 10, White plays 11 and 13, then makes the fencing-in move of 15. I assessed this as bad for Black. However, this is a hallucination, which is my forte. Black cuts at 1, plays 3 and connects at 5. After incurring these moves, things will not go well for White. Black exchanges 7 for White 8, then cuts White’s stones off with 9. Now there is a race to capture here. And then, the race to capture comes into effect with White 10 and 12. But when the sequence through Black 19 is played out, it becomes clear that White cannot possibly win the race to capture. 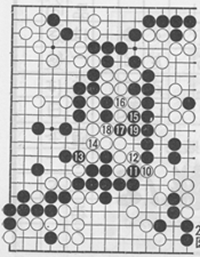 In the previous diagram, if Black obligingly cuts anywhere else [to save the group], it is fine, but incurring this way of playing means that White is badly off. ― Therefore, instead of the direct playing method, it is best to go with the indirect method of the attachment of White 1 in Diagram 4, you know. An interesting technique [OR, line of play, in both cases, suji]. This article, in conjunction with the one posted here previously, shows how professional go players analyze board positions. It is hoped that this will give readers an idea of what to aim at in order to improve. By playing out games like this one on a go board, even without reading the analysis, a feeling for the rhythm of the stones is intuitively grasped, and will help develop one’s intuition. By augmenting that with the study of life and death problems, which GoWizardry also supplies in abundance, attainment of a high level of skill at the game is possible. That is what GoWizardry sincerely desires and the reason we work so hard to bring these resources to English speaking go players.